For an extended period over the weekend the hugely popular Imgur file-hosting site disappeared for millions of UK users. While there was speculation that the site had been added to the Internet Watch Foundation censor list, it soon became clear that the site was only unavailable to users of ISP Sky Broadband. TorrentFreak can reveal that yet again the ISP had attempted to block a torrent site but ended up blocking another site instead. Thanks to legal action by the Hollywood studios and major recording labels, more than a couple of dozen file-sharing sites are now blocked by the six leading ISPs in the UK. One of those sites is YIFY-Torrents, a particularly popular file-sharing site best known for its compact movie rips. Over the weekend TorrentFreak ran an article on the site which detailed its efforts to beat the censors. Although we aren’t privy to exactly what was going on behind the scenes at YIFY, we do know that in addition to other tweaks they were experimenting with CloudFlare, a CDN and security company which, according to stats released by the company last year, is used by hundreds of thousands of websites. What we also learned is that the main ISPs in the UK – BT, SKY, Virgin, TalkTalk etc – are each using their own techniques to try and render torrent sites unavailable to their subscribers. Tricks that worked on one ISP didn’t necessarily produce the same results on another, with YIFY managing to unblock Sky and TalkTalk seemingly quite quickly but with Virgin Media requiring more work. This is where it gets interesting. By using CloudFlare’s services as a front-end to YIFY’s caching servers alongside other backroom tweaks, YIFY managed to beat the censors to became accessible in the UK over the weekend. But that came at a price. As revealed by these extended discussions on Reddit and StackOverflow, sometime on Saturday Imgur was rendered inaccessible to all five million users of Sky Broadband in the UK. There was much speculation, ranging from Imgur somehow ending up on the Internet Watch Foundation’s blocklist to Sky simply being a “terrible” broadband supplier. However, there was a more straightforward but ultimately bewildering explanation. Sky employs an automated blocking system that polls torrent sites’ DNS records in order to quickly re-block them in the event they switch servers or IP addresses. “Sky regularly pull IP addresses listed on our DNS servers and adds them to their block list. This block list is then used by an advanced proxy system that redirects any requests to the blacklisted IP addresses to a webserver that the ISP owns which returns a blocked page message,” YIFY explains. Therefore, when YIFY began using CloudFlare servers in Australia, Sky pulled these IP addresses and blocked them in the mistaken belief that they were YIFY’s. Since Imgur uses the same IP addresses, Sky’s automated blocking took the site offline, to the huge disappointment of countless customers. Unbelievably this isn’t the first time that Sky’s systems have managed to block entirely innocent sites. Back in August, Sky blocked TorrentFreak.com after EZTV experimented with its DNS settings and just days later it blocked RadioTimes and other sites following a screw-up initiated by the Premier League. Of course, to some extent this whole blocking problem has been placed in Sky’s lap by the High Court, but by now one would have thought that the ISP would have mastered the process. Allowing their systems to be dictated to by other external systems over which it has no control can never be a good idea. 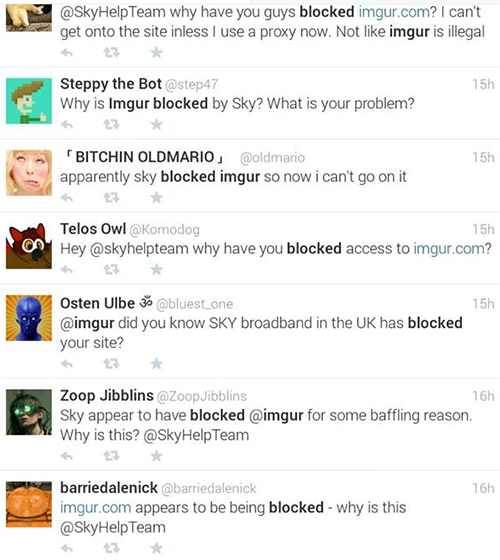 Sometime yesterday Imgur was eventually unblocked by Sky.